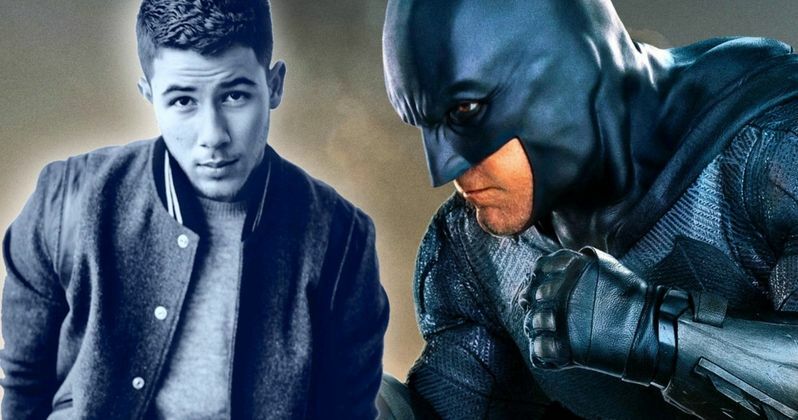 Nick Jonas is apparently interested in becoming the new Batman. It was recently confirmed, after literally a couple of years worth of wondering, debating, rumors, conflicting statements and lots of frustration, that Ben Affleck is done as the Caped Crusader. While there are mixed emotions about that, it finally means we can move on and figure out who will suit up in what is at least tentatively titled The Batman. With the era of Batfleck officially over, some lucky actor is going to be handed a huge opportunity. In the wake of the news that Ben Affleck has moved aside (or was forced to step aside, it isn't really clear) many have taken to the internet to suggest who they think should sport the cape and cowl in director Matt Reeves' upcoming DC Comics adaptation, which will reportedly center on a younger version of the caped crusader. Replying to a recent Instagram post asking fans who they would like to see in the role, Nick Jonas took the opportunity to throw his hat in the ring, simply replying with the following. "First name Nick. Last name Jonas." That is either a very confident way to try to drum up some attention, or, more likely, a joke that isn't meant to be taken seriously at all. But, just for fun, let's treat this with a degree of seriousness. Nick Jones started out in music alongside his brothers in The Jonas Brothers, but that also included the TV series Jonas. Since then, Nick Jonas has dabbled in acting and proved he can at least help carry a blockbuster in Jumanji: Welcome to the Jungle. Granted, the movie would have been just fine without him, but he certainly didn't derail it. So, he can act, at least a little. Let's not forget that he also played an MMA fighter in the popular DirecTV series Kingdom, proving he has what it takes to not only be an action star, but also someone who could fight crime and beat on big villians like The Joker and Penguin and make it believable. Nick Jonas is 26-years-old. If Warner Bros. wants a guy who can carry a franchise for years to come, that's a pretty solid age. Batman needs to be physically imposing. Jonas, for what it's worth, is in very good shape. Bruce Wayne needs to be charming. There are likely a great many people out there who would say that they are susceptible to the charms that Jonas has to offer. Laugh if you must, but, on paper, there are worse choices. To be fair, the internet was in utter disbelief when it was announced that Ben Affleck was going to be Batman. Now, there are quite a few DC fans who consider him to be, despite the divisive movies he was stuck in, a great, if not the greatest on-screen Batman we've had. There would undoubtedly be even more surprise and backlash if Nick Jonas were announced as our next Dark Knight. And, let's be real, it's not going to happen and I'm not actually, earnestly suggesting it could/should happen. Just having a little fun with the information we have before us until some real frontrunners emerge. The Batman is set to hit theaters on June 25, 2021. Feel free to check out the original post from the Hypebeast Instagram below.